The most convenient coffee cart you will find anywhere. Plug in the coffee maker, plug in the microwave oven, and roll it on handsome heavy duty locking swivel casters to where it fits best. The stand has built in 20 amp electrical outlets with the 9 foot power cord, it will plug into your existing wall outlets. This coffee cart has a lifted bottom that makes sliding a water bottle in very easy. The OCC36-WET office coffee stand is Made in the U.S.A and offers an all metal construction with bottled water shelf and trash chute. Quite simply, nobody makes a better-quality product than this cabinet. All metal heavy gauge double wall steel construction. Metal door with lock and non-sag custom hinge. Coffee maker, microwave, Bottles and accessories not included. Dimensions: 36"H x 36.25"W x 19"D.
3-10 Days Before Ships Depending On Customizations. Adjustable side cup dispensers, 8-12 oz cups, inside rim diameter is 2 3/4" to 3 3/8". 8x8 or 10x10 removable magnetic company logo. Liftgate Shipping, needed for Residential or no loading docks. 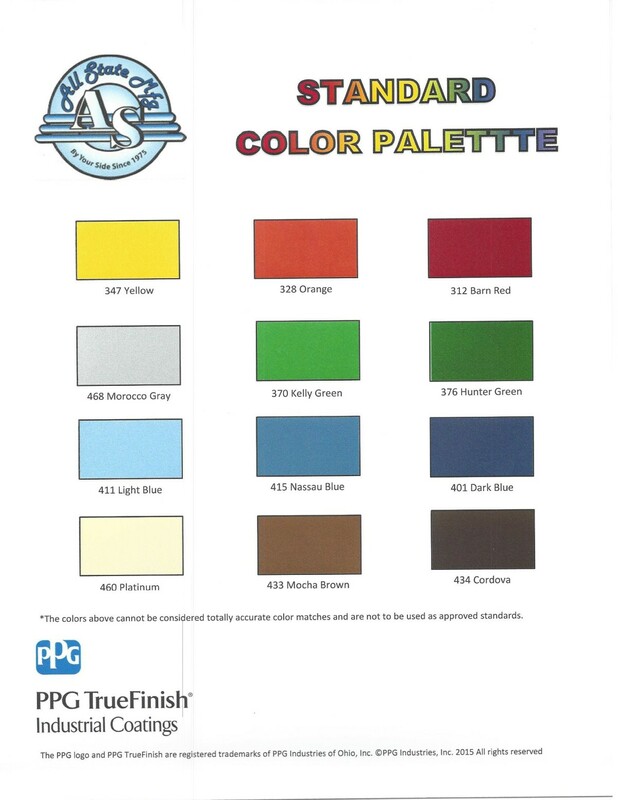 Choose a custom color for your new office coffee stand. Please remember colors sometimes look different over the Internet and differing computers. While we have done our best to preserve likenesses, there are always some differences in what you see and what is ultimately presented. To ensure safe delivery of this proudly Made in the U.S.A. cabinet, we will wrap and package this cabinet safely onto a pallet for safe delivery to your door. The OCS 360 is All States newest coffee stand, designed to be used with today's coffee makers and their merchandisers. Added condiment storage making the OCS 360 the only OCS stand that has 8 condiment selections. The OCS 360 brings a rich, industrial geometry to the office. With the same boldness in steel, the new OCS 360 is a stunning home for your first-class coffee system.